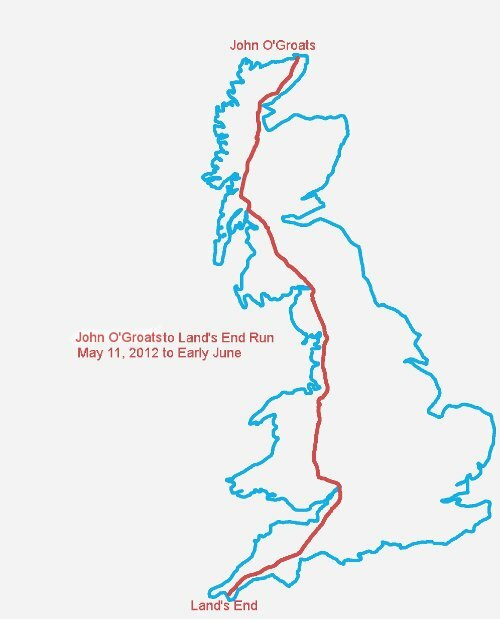 I will be running roughly the same route as the JOGLE Race which will have just finished when I start. This will take me down the western part of Great Britain and take me through Scotland Wales and England. Approximate distance is 863 miles. I will try to post here and on my twitter and Facebook accounts (both /VBUltrarunner) during the event but I don’t know what kind of coverage I will have. I’m looking to have fun! This entry was posted on Friday, March 9th, 2012 at 12:31 pm and is filed under Uncategorized. You can follow any responses to this entry through the RSS 2.0 feed. You can leave a response, or trackback from your own site.